The Robotic Arm Edge Kit is a fun project that allows you to build a robotic arm with five degrees of freedom and a gripper. This robotic arm uses five gearbox motors to produce 5 DOF Degrees Of Freedom. The base provides 270° of rotation with 180° of movement at the shoulder. The arm bends 300° at the elbow and the wrist can turn a full 120°. The two fingered gripper claw can open as wide as 1.77 inches and features a bright white LED. It's not an industrial robot arm used for manufacturing: it can only lift up to three and a half ounces. A built in gear protection mechanism will produce an audible clicking sound when overloaded. This kit is primarily intended to teach the principals of robotic arm technology. After assembly, this kit is operated by a kid friendly five button wired remote. A PC USB Interface is available separately to increase the functionality and educational value. This is a hackable kit and people have had success controlling the arm using a variety of microcontrollers. 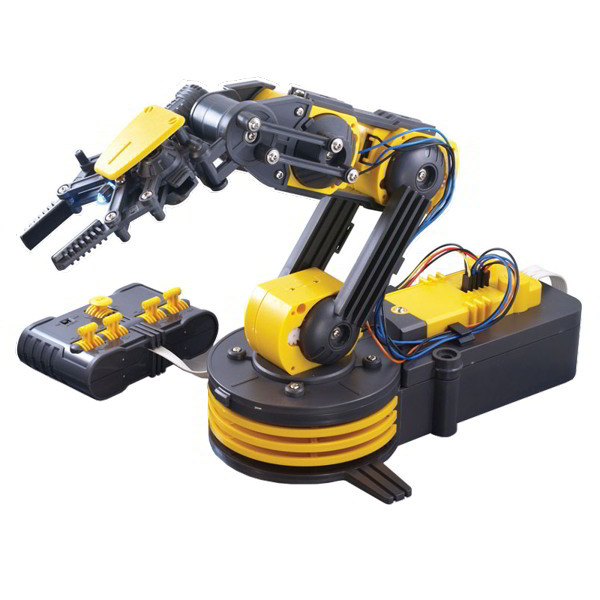 The Robotic Arm Edge Kit can be assembled in about an hour by following the detailed step by step instructions. No soldering is required. A Phillips screwdriver, wire cutters and long-nose pliers are needed for assembly. Manufacturer recommended for ages 13 and up. Younger children should seek assistance from adults but can participate in assembly by helping to identify parts and learning to use a screwdriver. Operating the robotic arm requires four D sized batteries which are not included.